The idea of this blog is to include non-FRA events, which will not appear in the regular Results section - mainly, but not exclusively, ultra-distance off-road events - undertaken by our members. Historically we have pandered to J Fulton Esq. (sorry, I do of course mean we have traditionally included RR) by putting Round Rotherham in the main Results, it's entirely possible that in future they will appear in both places. The Haworth Hobble is a race for singles or pairs with mostly single runners taking part. During the event there were hot dogs, doughnuts, whisky and other refreshments. There were no details of the number of starters and those who retired.There were certainly some runners who retired but without those details it is not possible to state the number of starters. There was a very stiff breeze to start with and sideways rain. The wind caused large waves on the first reservoir which would not have been out of place in the North Sea. The conditions eased off later to my dismay since I had been enjoying the wild weather and had been hoping for things to deteriorate. The shot-blasting by hailstones provided modest consolation for the sun coming out. There are three versions of the Spine Races. The Spine Race itself follows the entire Pennine Way from Edale to Kirk Yetholm in Scotland. The shorter Spine Challenger starts at Edale but stops at Hardraw. The Spine Challenger MRT is the same as the Spine Challenger but is solely for active members of rescue teams. The races commence at different times which reduces crowding and checkpoints being inundated with runners. The Spine Challenger started at 8 am on Saturday 12 January 2019 with the Spine MRT Challenge starting half an hour later. With the first wave of runners out of the way the organisers could register and kit check the rest of the runners enabling the Spine Race to start at 8 am on Sunday 13 January 2019. No support was allowed for the runners other than a drop-bag being transported by the organisers to checkpoints along the route. The races have quite a reputation for being brutal due to the harsh winter conditions; the terrain and the darkness. Nevertheless they attract entrants from around the world. Jim Mann set a new course record beating the previous best time by 2 hours 48 minutes and 53 seconds. A very impressive time indeed. Jasmin Paris set a new course record of 83:12:23. The previous record was set by Eoin Keith in 2016 in a time of 95:17:00 and remains the fastest time for the male category. Jasmin's outstanding result beats Eoin's best time by 12 hours 4 minutes and 37 seconds. Her achievement is all the more remarkable given that she was breastfeeding during the race and expressed milk at four of the five checkpoints. Jasmin's winning time which was 15 hours ahead of the next runner made headlines around the world. Meanwhile, somewhat further behind my recollection of the event is set out below. The Spine Race started at 8 am following the Pennine Way over Kinder Scout, Bleaklow, Black Hill, Standedge, the M62, past various reservoirs and Stoodley Pike and on to the Hebden Hey checkpoint. The day started with a bit of rain and wind and progressed to gale force winds as the day wore on. At times it was hard to even stand up let alone try to run in a straight line which slowed progress and sapped energy. Along the way there was plenty of wading through streams and rivers. By the time I got to Stoodley Pike my legs were soaked and I was suffering from a lot of chafing. At the Hebden Hey checkpoint there was plenty of food and hot drinks and time to recuperate including a full 90 minutes of sleep in a bunk bed. After eating more and messing about sorting kit out I set off into the night. Plodding along over Oakworth Moor I was falling asleep on my feet and trying to stay upright. There were refreshments at Lothersdale which revived me a bit and with the daylight things seemed better. By the time that I got to the Malham Tarn checkpoint it was already dark. I was already behind in my planned schedule so didn't stay long although my urgency arose mainly from the weather warning at the checkpoint. Gale force winds were forecast to build up within the next few hours. Fountains Fell was tackled with the wind picking up. On the ascent of Pen-y-ghent the wind was battering me and threatening to pluck me off the rocks adding to the sense of adventure. Having passed the summit the descent was fairly tame but went on and on. At the cafe at Horton-in-Ribblesdale (open all night for the Spine Race) there was a chance to sit and enjoy some welcome refreshments. I was by then in about 34th place so doing reasonably well although feeling tired. I dozed with my head on the table as other runners came in and went out again to overtake me. I continued to doze and had more to eat and drink. When I finally managed to drag myself to my feet and leave I had been there about an hour and a half but felt better for it although a bit cold from just sitting and not moving. In order to warm up I broke into a run and kept going which allowed me to regain some of the places lost while resting. Along the Cam Road the wind was howling and making a terrible racket. Wading through the wet and muddy conditions my feet were getting waterlogged and I could feel blisters coming on. In the wild weather stopping to sort my feet out was not my priority and I wanted to get to the next checkpoint. My legs refused to move as quickly as I wanted them to but I finally got to the Hawes checkpoint even further behind my own planned schedule. Eating and resting at the checkpoint was good and I allowed myself 90 minutes of sleep in a bunk bed there which was superb. The checkpoint is small and was crammed with lots of competitors, checkpoint staff and medics who sorted out my blisters enabling me to continue. One final task before departing was to sort out kit amongst the mountain of drop-bags and limited space to find things. A well-ordered drop-bag can save lots of time and effort and I resolved that next time I would strive to be more organised. I finally left the checkpoint mid-morning whereas my plan had been to set-off around 4 am. The schedule was slipping but I was still moving forward. Great Shunner Fell is a great big lump of a hill which climbs gradually but this means the journey to the top is further. The descent on the other side was welcome though giving scope for a bit of running. A photographer there took some photos and I challenged him to a race down and he sped off ahead of me. Approaching Thwaite my anticipation of cake and hot chocolate at the delightful cafe was growing in intensity. The notice on the door proclaimed that it was closed for the winter but open again in spring! I consoled myself with a packet of Eccles cakes and some cold water before resuming the journey plodding on to the Tan Hill Inn. Suitably refreshed there and having some blisters attended to by medics enabled me to continue north over the soggy Sleightholme Moor; under the A66 underpass and more moorland to checkpoint 3 at Middleton-in-Teesdale. The food there was excellent and presented with a choice I found it easier to have one of each of the main meals offered plus cake and copious hot liquids. 90 minutes in a bunk bed was good; more would have been better but the clock does not sleep so I got up and went back to the rest area to eat again. At the time I thought that I could be happy sitting there for a hundred years but there was a race to run so it was time to put the cold, damp and muddy shoes back on and head out onto the next leg. It was already daylight as I left and passed other runners coming in. They must have been going all night and would now be faced with sleeping and missing some of the limited daylight or pressing on again with hardly any rest at all. I did feel sorry for them and hoped that they would be okay. The next section has some interesting scenery to occupy a weary mind and body - Low Force, High Force, Cauldron Snout and High Cup Nick. Before I reached the last of these there was a sharp pain in my right achilles tendon which was a concern to me. It got worse as I went on and I ignored it hoping it would go away. Fortunately towards the end of the day it had not developed into anything more serious. The cafe at Dufton was a welcome place to rest and eat prior to the long slog up Knock Old Man and beyond. The icy summits of Great Dun Fell, Little Dun Fell and Cross Fell were not places to hang around and linger. I increased my pace to get it over and done with while trying to avoid the frozen puddles and pools which sometimes bore my weight and at other times the ice broke causing me to wade around in the icy water. The strong breeze gave me an incentive to get off the tops as quickly as possible and down to Greg's Hut for a chance of a hot drink and a chat with the nice people there. After that it was the long slog along a stony track to Garrigill and a few more miles across mainly farmland to checkpoint 4 at the YHA at Alston. More food and 90 minutes of sleep in a bunk bed partially rejuvenated me. After having some blisters attended to by medics and eating the mission resumed. However, after just a few miles a blister on my heel was causing me to limp badly so I stabbed it with a penknife which allowed the fluid to drain and progress to continue. I had been looking forward to running along Hadrian's Wall in the daylight but by the time I got there it was already dark. Nevertheless it was interesting going along it before heading north across moorland. It was in the forests that drowsiness started to take hold and I was stumbling around sleepwalking and sleeprunning. From time to time I would jerk awake just as I was about to fall. It was as if time stood still and all the trees looked the same. Had I been going around in circles and making no progress at all? No, it was that the ill-defined path lacked variety. On one occasion I awoke with a start thinking that I was in a supermarket and I was in a panic because I could not find the frozen peas aisle. Gradually it dawned on me that I was still on the Spine Race so I kept trudging forward. Out of the forest and across moorland there appeared to be someone watching me - safety crew perhaps? But why the fishing rod? There wasn't even a stream or pond there. As I got closer they disappeared only to re-appear further along the route several times. At the Horneystead Farm there was a sign stating "Pennine Way Pit Stop" which was sufficiently persuasive to draw me in. There were welcome refreshments there and seating with a box for voluntary donations towards the items on offer. A comfy chair took me prisoner and prevented me from leaving. I stayed there in a torpor for quite a while as other competitors came and went. Eventually I was able to escape from the comfy chair but the inactivity had led me becoming a bit chilled. To warm up I set off at a brisk pace towards checkpoint 5 at Bellingham along fairly easy terrain. It was already light when I arrived at the checkpoint. I ate, sorted some kit out and had medical attention for the blisters and was given anti-biotics for a developing chest infection (to carry around if things get worse but I was able to finish without resorting to them). There were no bunk beds at this checkpoint but I was lucky enough to find a spare settee to sleep on for 90 minutes. I set off in deteriorating weather and had not got far before darkness fell. Forest tracks take away the need for careful navigation and enable a runner or walker to doze off with either one or other or even both eyes closed to rest while moving forward. From time to time the edge of the path is veered into causing wakefulness if only for a few seconds. Amazingly I was able to stay upright and not fall over although there were quite a few near misses. A couple of times I brushed the snow off large clumps of heather to sprawl on them briefly to rest before resuming the journey. There was chance to sit down at the Byrness intermediate checkpoint and eat but there was a time limit for stopping there of 30 minutes. I left feeling fatigued with blisters on aching feet and throbbing and aching knees. The forecast was high winds, snow and bad weather on the Cheviots and I didn't feel in a fit state to continue. I was dead tired and found a pleasant graveyard to sleep in and resolved to sleep until I woke up rather than set a time limit. About four or five hours of sleep went some way to improving my condition. The ascent onto a ridge warmed me up and I was encouraged that by now there was only about 25 miles to the finish. The route briefly crossed into Scotland before passing some Roman camps and at Hut 1 it was already daylight. The friendly checkpoint staff there included a medic so another chance to reduce the problems with blisters and rest a bit. A few other competitors came and went so I lost a few more places but at that stage I was thinking more of finishing rather than anything else. The worst of the weather had been in the night and weather was now calm with good visibility over the frozen terrain. My speed was limited by the pain in my feet and knees and also general tiredness. At Hut 2 I was greeted by a media scrum which was unexpected and interesting. A hot drink and a chat lifted my spirits along with the thought that it was now only about 6 miles to the finish. Also, there was another runner about half an hour ahead of me. I tried to run as best as I could and as I started the descent from the ridge I saw someone ahead which caused me to quicken my pace. Looking back he spotted me and he also quickened his pace. Apparently he had seen my bright yellow hat and for future events perhaps I will use camouflage for the final stages of a race. With the twists and turns in the route he was in view at times and at other times out of sight. During the times of lost visual contact I put on spurts of speed to try and sneak up on him. He seemed to be using the same tactics because the gap was not closing very much. There was a final uphill road section that slowed me down but after that it was all downhill. I saw him and burst into a run but he saw me and did the same. I was gaining but the finish was just around the corner. A final mad sprint to the finish enabled me to get within striking distance of victory. In the end we both touched the wall of the Border Hotel at the same time to both finish after 152 hours 21 minutes and 37 seconds after leaving Edale the previous Sunday. When the final results came out an hour had been added on to his time (presumably due to a time penalty) so the final sprint had not been necessary but had nevertheless been fun and good to finish in style. During the course of the event I met some great people - both fellow competitors and event staff. It was a pleasure meeting them all; running with some; walking with others and being looked after by others. I have already signed up for next year's event. Due to forecast nasty weather and the likelihood of things deteriorating significantly and risking runners being stranded on the wrong side of a mountain range the organiser invoked a bad weather course. This followed the normal course from Askham passing St Peter's Church near Martindale and Patterdale but involved a U-turn before the top of Sticks Pass and a return to the start following the outward route. The route therefore missed out Swirls car park on the other side of Helvellyn; Birkside Ghyll; Raise Beck and Grisedale Tarn but meant runners got to tuck into the soup and other goodies back at base earlier than planned which as the weather worsened seemed welcome. As the day progressed the winds grew stronger and the driving rain stung like thousands of tiny needles. A trail run around Rotherham following the Rowbotham's Round Rotherham footpath mostly over farmland and rural areas on sign-posted paths, bridleways and roads with very little ascent. The weather was about perfect for running being a bit chilly early on and warming up as the day went on. Mostly clear skies were augmented with some friendly clouds that never once threatened rain. Mick Cochrane was the first MV70 finisher out of 12 starters (2 DNF and 10 finishers). There was a new Race HQ this year at the Manvers Waterfront Boat Club at Wath upon Dearne north of Rotherham. There was the option to sleep at the event centre on the Friday night to avoid a very early morning and travelling prior to the race. I opted for this and slept on the floor in a room containing another runner who was snoring like a rather old tractor long overdue for a service struggling up a particularly steep slope. The lights went on early on the Saturday giving plenty of time to get ready and watch the 6 am wave of starters depart. They were all reeled in and overtaken later when I set off in the 7 am wave of starters. The weather was ideal for running - a bit chilly in the morning at the start but warming up later with clear skies and no rain. It was dry underfoot facilitating fast running. Indeed, nearly 17 minutes were taken off the course record. The new record of 6 hours no minutes and 52 seconds was set by Ben Hague of Rotherham Harriers and AC. This was more than an hour faster than the finishing time last year in 2017. This was the last race in the Runfurther 2018 series. In the individual results John Vernon of Dark Peak Fell Runners was third MV60. Dark Peak Fell Runners were very nearly third being just 4 points short of overtaking Horwich RMI Harriers. A new course record on the final race reduced the scope to gain extra points and leap into third place. Starting from the Old Cardington Lane at 1 pm on the Saturday the route visits the summits of Caer Caradoc and the Lawley before Pole Bank (part of the Long Mynd), the Stiperstones and Earls Hill and then over the border into Wales to the top of Corndon Hill. Back in England Black Rhadley Hill is tackled before going back up the Long Mynd to Pole Cottage prior to the final ascent up Ragleth Hill before finishing in Church Stretton in the dark (or after sunrise for the slower participants). Compulsory grouping applies after dark with participants grouped into at least threes. The weather was dry but it nearly rained on the Stiperstones when the wind picked up and the temperature dropped. Some frost was observed in the night. 43 miles (69km), 5413ft (1650m) of ascent. This is a point to point trail ultra that runs from Ashbourne in the far South of the White Peak along the fully signed Limestone Way path through the White Peak to Hope where the Dark and White Peak meet. This undulating route starts at the entrance to the Tissington Trail in Ashbourne, and follows the trail just past Tissington itself, then leaves the Tissington Trail and heads across to the village of Parwich. From here the views of the White Peak begin to open up as the route follows the Limestone Way to Bonsall where the first of three checkpoints en-route is located. After dibbing in, the route takes us to Youlgreave via Winster and Robin Hood's Stride with great views of the Hermit's Cave and Nine Stones Close stone circle. From Youlgreave the route heads to the second checkpoint at Monyash Village Hall, via the picturesque riverside path up Bradford Dale, then down a steep limestone staircase into Lathkill Dale. Leaving Monyash the route progresses along the most laborious section of the whole race, a long climb along a roadside path to the outskirts of Chelmorton via Flagg. Joining the trail again the route heads down a steep wooden staircase into Miller's Dale. Here the race diverts off the Limestone Way, heading to Wheston then rejoining it at Hay Dale for a last mile or two, before it reaches the third and final checkpoint at Peak Forest Reading Rooms. From here the route climbs onto Old Moor and descends into Castleton via Cave Dale. After a brief section of road through Castleton the route takes the riverside path along Peakshole Water to Hope. From St Peter's Church in Hope the route double-backs along Castleton Road to the finish line at Hope Sports Club. The weather was cool and sunny, with a ground frost in the first half hour of the race. This was in stark contrast to the 2017 event where the check point cut-offs had to be extended, as much of the route was muddy or water-logged, and visibility was low due to mist for much of the day. This year was mainly dry underfoot making for a faster race. Even the Cave Dale descent was dry enough to be runnable with tired legs, 41 miles into the race. There was also a Half Limestone Way Trail Run which ran the final 17 mile (27.5km) leg of the race from Monyash to Hope with 1965ft (599m) of ascent. Starting in Ulverston the course follows the Cumbria Way through the middle of the Lake District past Coniston Water; along the Langdale valley; up to Stake Pass; through Keswick; past Skiddaw House via the Latrigg Car Park; to the summit of High Pike; down to Caldbeck; through Dalston and finally to the finish inside Carlisle Castle. The race starts in darkness and all but the fastest runners finish in the dark too. Along with solo runners there were relay teams of either two or five per team for those wishing to spread the journey between several runners. The results below represent just the solo runners. The weather was mild and no rain giving good conditions for running. Continuing with the summer trend, it was too hot the first 2 days & ok on the 2nd. There are no mountains & barely a hill en route; the coastal path does also deviate inland frequently & follow roads so you also get to run over/through all types of landscape. The event is very well supported by a small army of v. friendly/experienced marshalls & the whole event has a kind of 'family' feel to it as most of the event staff & marshalls are from Anglesey. I really enjoyed it overall & it gave me the intro to multiday events I wanted but yes, the route wasn't as interesting as I hoped for." The GPX of the route indicated 101.8 miles (163.8 km) and 24,195 feet (7375 m) of ascent. The race started at 8 pm on Friday 17 August 2018 from Christ College, Brecon with the select band of entrants heading for the Brecon Beacons. On the lower slopes of Cribyn the rain started and the wind gradually grew in intensity and at the summits of Cribyn, Pen y Fan and Corn Du the weather had become pretty wild and thick clag had joined in to make the conditions more interesting. At the first checkpoint at the Storey Arms there was some welcome water, cake and a few nibbles from the back of a car. Unlike the Lakeland 100 where entrants are mollycoddled and pampered with cosy indoor checkpoints at regular intervals with hot food and drink the Beacons 100 has entirely outdoor checkpoints so there is no respite from the conditions at each checkpoint and, accordingly, runners need to be able to cope with less frequent stops and be able to look after themselves. Nevertheless the checkpoints were sufficient to get around if supplemented with provisions taken by runners themselves. More summits were visited in the dark including the summits and tops of the Black Mountain before visiting the north-west corner of the route at Llanddeusant in the early morning daylight. The route crossed seldom visited areas of the Black Mountain area to Glyntawe and porridge pots at the roadside checkpoint. The nourishment was needed to tackle one of the many river crossings and babies' heads tussock grass and marshy ground without paths. The going here was slow and even walking was not easy and the slow progress meant competitors would be struggling to beat the cut-offs later on. Whereas the Lakeland 100 is a trail race over mostly decent paths and trails the Beacons 100 is more like a fell race over rough ground. At the A470 drop-bags were available at the checkpoint prior to some steep ascents and descents and battling through vegetation and crossing more marshy ground. Some minor hills were crossed on paths before going up and down Tor y Foel. A long section along a canal invited running to make up time but walking was the more pleasant option. The checkpoint at Crickhowell offered fish and chips which was a nice surprise. The Black Mountains were tackled in the dark, wind, rain and thick clag. It was barely possible to see your own feet in the dense mist let alone the path ahead and trying to pick a route through the rocks and knee deep bilberry added to the challenge. Later waist high heather threatened to swallow runners who drifted off the path. Thrashing around in the vegetation on the steep slopes certainly acted to slow progress. The final checkpoint near Talybont-on-Usk was reached in daylight where I paused to recuperate prior to tackling the last big ascent and descent. After passing the Talybont Reservoir the climb up Twyn Du was hampered by very strong winds necessitating leaning forward by about 45 degrees to avoid being blown backwards. The iconic Carn Pica heralded the route becoming less steep but the wind increasing in intensity towards Waun Rydd. Descending the other side the wind was just as strong but was pushing from behind. The final few miles were along roads and canal and I was concentrating hard on not falling asleep and finishing without some unscheduled swimming. Fortunately I kept to the path and made it to the end without falling in. It was a great event and one to try again. The above details are from last year's race and this year there were some small adjustments to the route so the distance and ascent may be slightly different. The route embraces some interesting and varying scenery from both the White Park and Dark Peak areas of the Peak District. It starts in Bradwell with a gradual ascent to the Limestone Way before descending to Castleton via Cave Dale; then over Hollins Cross and down to Edale before a climb up The Nab and across to Rowland Cote Moor (but not to the Druid's Stone as in previous years); up Lose Hill and around the edge of Win Hill and across to Bamford; past Dennis Knoll to run along Stanage Edge followed by Upper Burbage Bridge and Burbage Bridge; down Padley Gorge and past Upper Padley and Leadmill before a trail along Abney Clough then up and over and back down to the finish in Bradwell. The weather was warm and sunny and it was dry underfoot. There was also a Half Tour of Bradwell of about 16 miles and 3,000 feet of ascent representing a truncated version of the Long Tour of Bradwell. The route starts and finishes at Coniston with a circular tour of the Lake District taking in Seathwaite, Eskdale, Wasdale Head, Black Sail Pass, Buttermere, Braithwaite, Blencathra Field Centre, Dockray, Dalemain, Howtown, Haweswater Reservoir, Kentmere, Ambleside, Chapel Stile and Coniston Fells. The route consists mainly of paths and trails. With the heat wave building to a climax over the summer with each weekend seemingly hotter than the one before the event was anticipated to be challenging. Indeed, throughout the week the newspapers had been predicting Furnace Friday. The race started on the Friday at 6 pm on dry dusty trails that had not seen water for quite some time and coping with the heat was a challenge right from the start. Within the first few hours a number of competitors had retired due to heat exhaustion and hyperthermia. During the night the temperatures mercifully dropped and rain showers kindly staved off further problems with the heat. On the Saturday morning drizzle turned to heavy showers and then torrential rain and some runners were now beginning to suffer with hypothermia! By mid-day the sun had returned but this was not to last and the conditions fluctuated between dry, light rain and heavier rain coupled with winds that got stronger and stronger as the day wore on. Some runners even reported being blown off their feet by gusts and those that managed to stay on the ground had to battle forward against the oncoming wind. Faster runners made it to the finish line before the second night while others finished either during the night or before the cut-off at 10 am on the Sunday. The rain then continued consistently until late afternoon. The finishing rate was 51.3% (50.1% for a finish within 40 hours). For the Lakeland 50 the finishing rate was 91.5%. The race has always taken place in September but this year it was moved to July. This meant that the early morning start commenced in daylight rather than the first two hours being in darkness. For the faster runners it was possible to finish in daylight too. However, the enhanced visibility was offset by the July heat. Even on the tops after sunset it was too warm for comfort. Starting from the Talybont Reservoir the course heads west to take in a number of peaks south of Pen y Fan and ultimately to the twin peaks of The Black Mountain. It then heads back east but about a mile or so further north to take in different peaks on the return trip including the rollercoaster ridgeline of Corn Du, Pen y Fan, Cribyn, Fan y Big and Bwlch y Ddwyallt prior to the final descent back to race headquarters. Normally there is a fair amount of wet boggy ground but with the recent weeks of hot and dry weather there was barely any damp ground at all. The day was hot with clear skies giving no respite from the punishing sun making it hard to push too hard. Indeed, the strategy for the race was to carry as much water as possible between checkpoints and the normally reliable streams around the course were depleted and just had semi-stagnant puddles unsuitable for drinking. Most runners were from Great Britain but other nationalities included Australia, Canada (the winner of the race), Ireland, France, Spain and the Netherlands. There was a drop-bag facility at the Storey Arms checkpoint which could be accessed both on the way out and the way back.Free camping was available on Friday and Saturday night. There was also a short course option missing out the western part of the long course loop giving a route of 36 miles (58 km) and an ascent of about 3,000 metres (about 9,842 feet). Of the 84 starters 72 made it to the finish giving a finishing rate of 86% for the short course (compared to a rate of 65% for the long course). The fastest man on the short course was Rob Forbes with a time of 5:52:24 and the fastest lady was Beth Pascall with a time of 7:16:27. The event took place on a very hot day with runners exposed to the blazing sun in mostly clear blue skies. Although this improved the views it necessitated taking much more water than usual but for most runners even that was not enough. The route follows the Pennine Way National Trail from near Bowlees which is itself a few miles northeast of Middleton-in-Teesdale to Alston. A coach usefully takes runners from Alston to Bowlees and from there a short walk to the start at the Wynch Bridge which spans the River Tees. The scenery conspires to mesmerise runners with features such as Low Force, High Force, Cauldron Snout, High Cup Nick, Great Dun Fell, Little Dun Fell, Cross Fell (the highest point on the Pennine Way), River South Tyne and various others. Initially the route is fairly flat enabling a fast start before gradually ascending before the descent to the approximate half way point at Dufton village. Thereafter the hills get steeper leading to the summit of Cross Fell and shortly after that past Greg's Hut. A long stony path leads downhill to Garrigill and the final checkpoint which was serving very welcome chilled drinks and a variety of snacks including melon, bananas and slices of orange. The route was fairly flat from there to the finish giving scope for more fast running for those with any energy left after the hills. The PB50 is run with the PB100 with the latter running the same course twice. It was quite hot: I drank more on this race than I have ever drunk on a race. My wife marshalled on 2 CPs & said both almost ran out of water twice. The race is just the Pennine Way from Malham up to Penyghent, the 3 peaks route round to Horton, then the Pennine way & Gordale Scar to Malham. Although Penyghent up & down was packed with 3 peakers, the rest of the route was pretty quiet. Nothing else to note really apart from the CPs having better range of food than I have seen before, ie. a lot more than just jelly babies, soreen & flapjack! The event took place on the hottest weekend of the year so far making the running hard work and sapping energy. South Wales is nearer to the equator than the Peak District and this seemed to intensify the debilitating effects of the savage sun and the searing heat. Indeed, it had not rained for some time giving rise to a route over parched and arid earth lacking in the marshy ground, mud and puddles normally associated with Wales. The race started at 7 pm on Friday 22 June 2018 from the outskirts of Cardiff heading north and past the neo-Gothic Castell Coch before turning west along trails. It was already dark upon reaching the trig point at Mynydd y Gaer and thereafter heading north. Various hills, forests and open moorland were passed as well as going through the old mining towns of Treorchy and Hirwaun. The night soon gave way to the dawn and the daylight enabled the enchanting Sgwd yr Eira waterfall to be fully appreciated as the path went behind the waterfall itself which was one of the highlights of the route. The exposed summits of Fan Llia and Fan Fryncyh offered no shelter from the blazing sun before dropping down to a lay-by on the A470 where a welcome checkpoint offered refreshments. Stockpiling as much water as could be carried it was off again and down to the Taff Trail before a steady albeit slow ascent of Corn Du and the rollercoaster ups and downs along the ridge to the summits of Pen y Fan, Cribyn and Fan y Big. Further along the ridge there used to be an area to test runners' navigational skills in a boggy area with peat hags but a new gravel path has spoilt this opportunity almost as far as Carn Pica. The long descent to the Talybont Reservoir was remarkably dry and lacked the usual soggy conditions which helped speed runners along. The next hill (Tor y Foel) made up for a lack of altitude with steep slopes which seemed all the steeper with weary legs after having just done the Brecon Beacons and the unrelenting heat of the day. Rolling hills followed and on the summit of Mynydd Bedwellte dusk was descending for a second night. Pausing to take in the views I was rewarded by a superb sunset with mostly orange skies behind the silhouetted shapes of Corn Du and Pen y Fan in the distance where I had been running (and walking somewhat slowly!) many hours and miles ago. The Welsh Valleys followed with a typical steep descent followed by a steep ascent coupled with battling through shoulder height bracken and low level brambles on seldom used trails on leaving New Tredegar in the Rhymney Valley. Taking advantage of the reduced temperatures of the night my pace increased and I was finally able to catch up with another competitor who barely paused at the Bargoed checkpoint. After a short rest I carried on in last place over rough stony trails and soon gained a place and pressed on hoping to overtake some others. However, it was impossible to know if the runners in front were close or many miles in front or, indeed, had already finished. There were elements of hope and desperation as I tried to force myself along faster than my body wanted. From time to time I found myself falling asleep walking and running and just had to push on as best as I could. The trail eventually gave way to tarmac although a nice grassy or muddy descent would have been ideal. Daylight was beginning to return as I passed Caerphilly Castle which was a welcome sight and distraction from the weariness trying to slow me down. Just past the castle was the final checkpoint and I was informed that a group of runners had left about five minutes before my arrival. That was heartening news and a brief stop would surely enable me to overtake them. However, the friendly checkpoint staff were kindly offering hot drinks and food and extra rest would put more of a spring into my aching legs. I was on the verge of departing when I noticed some Bara Brith which caught my attention and this source of nourishment would perhaps rejuvenate me and propel me onwards. Another cup of coffee was necessary to wash it all down. Meanwhile, the checkpoint staff looking at the trackers were able to report on the progress of the group of runners in front of me. They too had been suitably refreshed and now had a nearly 5 km lead over me with only 15 km from the checkpoint to the finish. I forced myself onwards through hilly forest trails and up to Caerphilly Common pausing to admire the view of Caerphilly Castle to the north and Cardiff and the sea to the south. Up and over Craig yr Allt but no sign of runners in front forcing myself to try and go faster. Then about 3 km from the finish I overtook another runner and from there it was flat trails to the end. Shortly after passing under the M4 there was not much more than 1 km to the finish and I resolved to run to the finish and was rewarded by being able to overtake a group of three runners reduced to walking the final part. Shortly before 7.30 am I crossed the finish line. Although it was good to finish part of me had wanted it to continue and I had enjoyed the varied scenery. It would certainly be a good event to do again in the future. There was also a 50 mile version starting from Brecon and then joining the route just before Corn Du and the Brecon Beacons. An interesting weekend with various events going on. In the Lake District the Ten Peaks Challenge took place while the Bob Graham Round was tackled Dark Peak style with a 100% successful completion rate comprising Dan Stowers, David Hakes, Kirk Hardwick, Fiona Lynch (Radcliffe AC) and Yvonne Beckwith. Richard Hakes has compiled an interesting report on the Dark Peak 2018 BG round which is in the Bob Graham section. Gregory Crowley took part in the Montane Spine Fusion Full (the summer version of the Spine Race that takes place annually in January each year). He finished in second place with a time of 91 hours 21 minutes and 58 seconds which is more than 42 hours faster than his January 2018 time in the brutal weather conditions at that time. Further south the South Wales 100 took place starting and ending in Cardiff and passing over the Brecon Beacons and a few other hills along the way.Steven Jones took part and this is covered in a separate blog. Starting in Hastings the route initially followed the coast before going inland to visit several villages before going back to the coast to pass through the edges of Folkestone and Dover and up the coast before going inland again to visit Sandwich then on to the finish in Dover. The route was mainly flat and coastal but also featured trips through lowland areas intersected with waterways and channels which boasted a prolific quantity of vocal frogs. Some paths were quite overgrown and this forced me to proceed bent over like a hunchback and shuffling sideways to avoid low hanging branches and overgrown vegetation on some of the narrow paths. On the first day it was extremely hot making running hard work and rather than risk burning up in the heat I reverted to walking with a view to finishing rather than a brisker pace leading to over-heating and pulling out with heat exhaustion. A spectacular thunderstorm lasting most of the night only brought brief respite since most the rain seemed to be falling some miles away. The next day brought even more heat and the checkpoints provided sanctuary from the searing heat of the sun. There may have been other Dark Peak Fell Runners taking part but the results do not show details of club membership. Weather: Very hot in the day and sunny but cold at night. The Pembrokeshire Coastal 100 follows the stunning Pembrokeshire Coastal Path from Dale to St Dogmaels, Cardigan. The picturesque route follows rugged cliff tops and sheltered coves; shingle beaches; winding estuaries and passes some small villages. The exposed coast gave no shelter from the blazing sun and at night the sea breeze and clear skies led to a very cold night. Pembrokeshire's coast displays a great variety of rocks and scenery. Nearly all of the rocks formed before the end of the Carboniferous Period some 290 million years ago. The oldest date back 600 million years and were observed running around the Treginnis Peninsula. Rocks younger than 290 million years old have been lost due to weathering and marine erosion. An observant runner might have noticed some igneous rocks at St Bride's Bay among the majority of sedimentary rocks such as Old Red Sandstone and Carboniferous Limestone formations. As the race progressed and moving north the underlying geology consisted mainly of sedimentary rocks laid down before the Caledonian mountain building period which ended about 400 million years ago. The folds and faults at Ceibwr Bay were created by this event. Indeed, they were so spectacular that they fully distracted me from the slog up the steep slopes. The last few miles lacked the magnificent scenery of earlier and the prospect of running along a tarmac road in the heat of the blazing sun was not welcome. So a leisurely walk to the finish avoided further over-heating. The conditions were fairly benign with reasonable weather and good visibility albeit it got quite cold at night. Conditions underfoot were relatively dry. 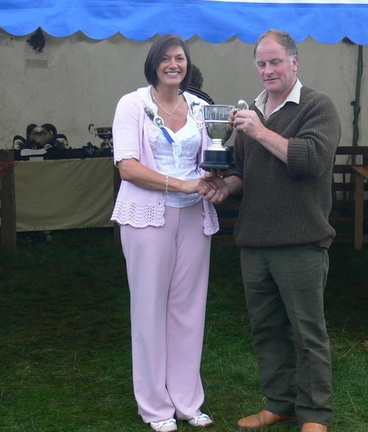 John Vernon had completed his first Fellsman 50 years earlier and was presented with a special award. He had enjoyed this event just as much as the first one. There were also walkers on the long course and a shorter course of 22 miles for both runners and walkers. The walkers started earlier giving them a head start. 32 walkers started the long course and 7 of them DNF'd leaving 25 finishers. All of the starters on the short course finished (40 runners and 52 walkers). Overall for all variants there were 175 starters; 13 DNF'd and 162 finishers. The weather was warm and dry but soggy underfoot in places. The unseasonably warm weather was energy sapping making it hard to maintain a decent pace. It was the 40th anniversary of the event so a special route of 40 miles had been devised to commemorate the occasion with special medals for all finishers. Starting at Sowerby Saint Peter's Cricket Club the route descended to the Rochdale Canal leading to the Calder & Hebble Navigation; at this early stage of the race the flat paths invited fast running at a pace that was not sustainable. Various tracks, trails and roads wound through and past Greetland, Ripponden, Cragg Vale, Withens Clough Reservoir, Todmorden, Bride Stones Moor (where I was unable to resist the temptation to divert from the optimum route to touch the trig point), Great Rock, Hebden Bridge, Horse Bridge, Pecket Well, Crow Nook Hill, Luddenden and back to the finish at the cricket club. I arrived at the start early but in a sleep-deprived state. The fast start combined with a warm day conspired to lead to me fading early on. Having recently acclimatised to running in blizzard conditions the heat of the early spring sun was challenging and as the day wore on sunburn added to the factors slowing me down. Near Horse Bridge a small fly landed in my eye and in an attempt to remove the creature I managed to rub salty sweat into both eyes causing near blindness. Staggering around looking for the correct path I managed to miss the tucked away entrance to the trail and floundered around barely able to see where I was going let alone the map. Finally after a long tortuous tour of most of the paths and trails in the area (some more than once) I arrived at the Pecket Well checkpoint. A marshal was able to kindly remove the troublesome insect and I was able to resume the run albeit now in last place and in danger of missing the cut-off points. In an effort to go faster I ran along without navigating as carefully as I should have done and missed some paths and turnings and had to battle across heather to regain the route at various points. After crossing the River Calder the finish was reached after one last climb. Although the day started with a cloudless sky and early morning sun/temperature inversion mist, it soon clouded over & rained to varying degrees for the rest of the day. This race was 2 x 31 mile loops & the 1st time I had done such a race - would I find it hard to do lap 2 in terms of motivation needed to leave the finish point again knowing exactly what I would be running along? In the event although I knew it would be another 4.5hrs in the rain & at times lots of mud, it didn't seem odd to be leaving the finish again. Unlike other races there was nothing exciting about the CP food (or the race route for that matter!) and as it was wet & cold, no-one stayed around afterwards so the finish was somewhat of a damb squib too. Yes the course is a fast course but I think that's the only merit of this whole event." Starting at Askham the route visited the summits of Loadpot Hill and High Street before passing Angle Tarn on the way to Patterdale. Due to adverse conditions on Helvellyn the loop to Grisedale Tarn; the Wythburn Church car park; Helvellyn; Whiteside; Glenridding and back past Patterdale was omitted this year. That just left Place Fell to be conquered in a white-out blizzard trying to pick out a route across the snow covered ground before racing back via Martindale Church for an early finish with soup and other refreshments. The weather had been fairly cold; with initially reasonable visibility before a white-out blizzard later on; strong winds on the tops but overall the wintry conditions added to the experience. There were reports of ice and hard-packed snow on the Helvellyn summit and a forecast for fresh snow on top which inspired the organiser to omit the Helvellyn loop on safety grounds. Originally the route would have been 42 miles with a 6 am start which was put back to 8 am since the route had been scaled back. On the Sunday I went to The Cheviots rather than rushing back home. The weather there was equally interesting with a white-out blizzard and knee deep snow approaching Windy Gyle. This more than made up for the deficit in the shortened run the day before and brought the mileage for the weekend back to a more respectable level.